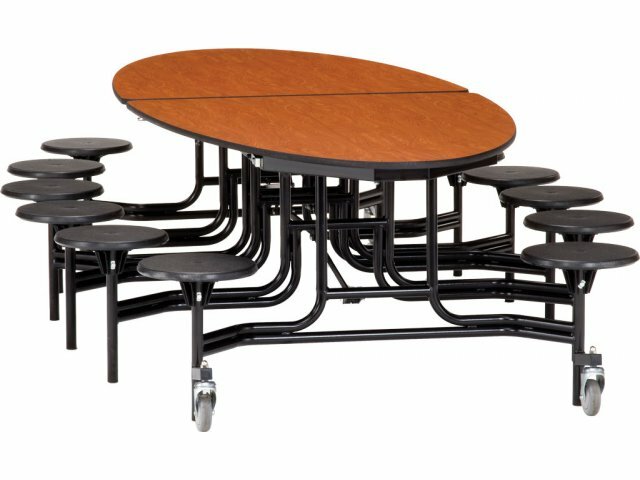 A plywood core makes a big difference when you have a cafeteria table that is being used on a constant basis. Cafeteria tables with stools allow students to have personal space while enjoying meals with their friends. 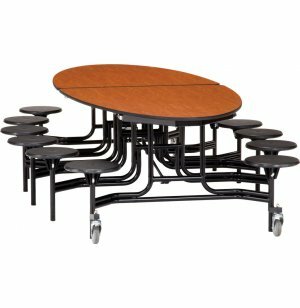 A durable build and functional design make these tables a great choice for your bustling lunchroom. High-impact reinforced stools are supported by tough steel washers and secured with specialty hardware. A torsion bar system enables one person to open and fold the table by releasing a manual lock from either side. Exceptional safety features protect your students. Automatic locking in both the open and closed positions prevents accidents. Heavy-duty casters lift off the floor when the table is in the open position and do not extend beyond the stools. This prevents tripping and sliding. These cafeteria tables are ready to serve your school through many years of lunches, snacks and more. Height Selection: Comes in standard 29"/17" table/stool height as well as 25"/13", 27"/15" and 32"/20".